A lecturer at Pachiappa’s College, a colleague and cousin of Sri Alasinga, worked hand in hand with Sri Alasinga in all his efforts with equal zeal. In many of his correspondences, Swami Vivekananda mentioned GG and Alasinga together. GG also shouldered the responsibility of an associate editor of “Bramhavadin” with his editor Sri Alsinga. Some years after Swamiji returned to India after his triumphant tours abroad, GG became his constant companion in his wanderings in the Himalayas even forsaking his academic position at Pachiappa’s College. It was at the behest of Swamiji to return to his house hold duties and attend to the task of propagation of Ramakrishna’s ideals in other parts of the South, like Bangalore, Sri GG returned to Bangalore and started the “Vedanta Society” with another eminent person Sri M. A. Narayana Iyengar (later known as Swami Srivasananda) as President and himself as its Vice-President. The Vedanta Society was the nucleus from which the Ramakrishna Mission came into existence at Bangalore (Bull Temple Road) and Ulsoor. He outlived his associate Sri Alasinga by 21 years all the time cherishing memories of the epoch making era at Madras while working for his Guru Swami Vivekananda. 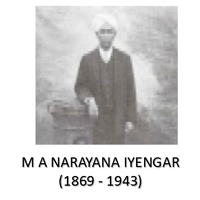 Another link in Sri Ramakrishna – Vivekananda movement, M. A. Narayana Iyengar, a descendent of the Pradhans held high positions in the Mysore Civil Service and was also a personal Tutor to the Yuvaraja of Mysore. 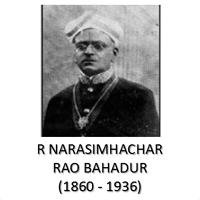 He, along with his associate Sri M. A. Srinivasachar, researched and produced authentic historical record of the role of the Mysore Pradhans and their rightful place in history and the saga of their great service in blood, sweat and tears, but for whose great sacrifices, the history of Mysore would have been different for the worse. In later years, he was one of the founder of the “Vedanta Society” as its President which was the point from which the Ramakrishna Ashrama was established. He helped the establishment in various ways including monetary help. He was a great devotee of the holy mother Saradha Devi and entered the Ramakrishna Order as a monk “Swami Srivasananda”. The big complex of the Ramakrishna Ashrama at Bull Temple Road, Bangalore is a living landmark to his memory. Professor of Sanskrit & Comparative Philology, Presidency College, Madras. After early schooling at Mysore, obtained an MA degree in Physical Science from the Madras Christian College as a favourite student of the principal Rev. William Miller. Worked for sometime as a researcher with the Railway Electrical Engineering Department, but returned to academics and was Professor of Physics and Chemistry; in the meanwhile blossoming into a erudite Sanskrit scholar and writer. Lord Ampthill, Governor of Madras, considered him as the best person to be appointed as the Professor of Sanskrit and Comparative Philology at the Presidency College. A brother-in-law of Sri Alasinga Perumal was fully involved in the Vivekananda moment. He pioneered for the first time to deliver a series of lectures on Chapters and Verses of the great work Bhagavadgita which he called the “The Hindu Philosophy of Conduct”. Such serial lecturers in English, hundred years ago were unheard of. His aim was for newly English educated youths to look inward into our heritage and religion and not fall prey to the Western cynical thought. Eighty eight lectures in all were conducted at weekends with a rapt audience listening to a most lucid, rational exposition of the great scripture was in itself epoch making. Lectures were universal in appeal explaining various views whether it was advaitic, dwaitic or his own vishistadwaitic. Those were days where modern recording gadgets were unheard of. The lectures were taken down by shorthand writers for printing it as a book. While the first volume was published by Prof. M. Rangacharya himself, there was long delay in preparation of second and third volumes. Sri Rangacharya had passed away in the meanwhile. 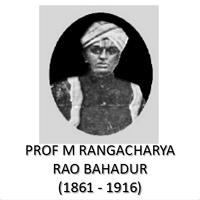 The written records of the lectures would have been lost for posterity but for the laborious painstaking efforts of Late Rangacharya’s erudite son Prof. M. R. Sampathkumaran and another erudite scholar Sri M. B. Varadaraja Iyengar and later by his son Sri M. B. Narasimha Iyengar. If one has to understand and appreciate the Bhagavadgita, Sri M. Rangacharya’s treatise is most lucid one. With the renaissance of the Vivkananda epoch the entire nation was seething with dissatisfaction of the foreign tyrannical rule and Indians were ready for any sacrifice for this end. The situation in Madras was no different. Gowthamasharamam, in the vicinity of Parthasarathy Temple, was centre of revolutionary activities and the freedom movement. 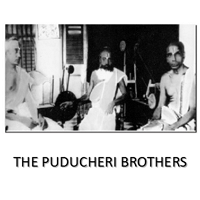 Three brothers Thirumalachar, Srinivasacharya and Parthasarathy of the Srirangapatnam family were in the forefront. The eldest Thirumalachari participated in the Satyagraha for the removal of Gen. Neil’s statue from Mount Road. The second Sri Srinivasacharya had some part in the Alipore Bomb case and was associated with Sri Bipin Chandra Pal and to evade the Police net escaped to Pondicherry along with the great poet Subramanya Bharati, and M. P. Thirumalachari (another great revolutionary who subsequently worked for the freedom struggle from abroad). The youngest S. Parthasarathy who toured the north and Nepal arranged for the escape from Calcutta of Sri Arabindo and his settlement in Pondichery. The brothers wanted to confront the British on the economic front. In association with Sri V. O. Chidambaram Pillai and V. V. S. Iyer started the “Swadeshi Steam Navigation Company” to run ships between Tuticorin and Ceylon. The brothers lost most of their savings and wealth in this venture which was torpedoed by the British and vested interest. Though the eldest and youngest of brothers did not see the dawn of the Indian freedom on August 15, 1947, Sri Srinivasacharya, lived to enjoy the fruits of freedom. Even today the “Gowthamasharamam” exists as a landmark and hollowed ground on which the freedom was fought. Though his earlier education was at Madras, he graduated from the Central College, but later obtained an M. A. from Madras in Kannada (the first one to get an MA in Kannada). Worked for some time in the Maharaja’s College, Mysore. Assisted Mr. B. L. Rice, head of the Archeological department and made epoch making discoveries of the “Shasanas” and ancient artefacts. Became the head of the archeological department. His name is synonymous with “Epigraphica Carnatika”, a world acclaimed work. He presided over Kannada Sahitya Parishad and won innumerable awards. We owe to him gratitude for his social services and the landmarks he created which exist even today in his memory such as the Venugopalaswamy Temple in Malleswaram, the Ubhaya Vedanta Sabha. 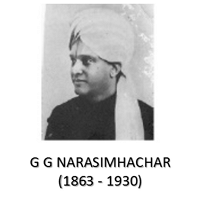 He presided over the Mandayam Srivaishnava Sabha and was one of its founding fathers. There are many more great personalities not mentioned here. Our salutations to them as well. Sri M. D. Srinivas, Saraswathy Bhandar, Sri R. N. Parthasarathy, Chennai. Grand Children of late Alasinga Perumal. Grand daughters of late G.G. Narasimhachar. Sri M.A. Ramakrishna, Sri M.A. Gopal and Smt. Vatsala Iyengar. Sri M. C. Alasinga Perumal and Sri Venkatarangan. Son, daughter, daughters-in-law, and grand children of the late Puducheri Brothers.